thenobodies80 wrote: So, to start the gameplay balancement/discussion.....what's your plan with the gameplay natty? 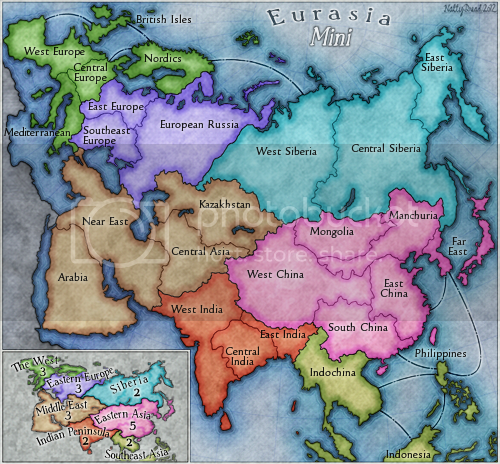 Well, firstly the gameplay would follow the gameplay of Eurasia in that each territory is a bonus area from Eurasia. So it's kind of like a reverse World 2.1 thing. I had to add territories to India & S.E. Asia since they would only be 2 territories otherwise, but other than that the gameplay scheme is accurate. Then, I thought about adding impassables, but I kind of feel they'd be unnecessary on a map this size - although, I'm not totally married to that idea, so if it becomes necessary to add them, I'm 0k with that. 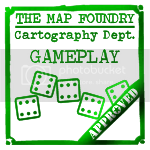 Other than that, I don't really know what else there is to do - I figure it's pretty well balanced, there are feasible bonuses to hold in all parts of the map, and it seems to work pretty well as it is to me. But then, if anyone can see any concerns about the current gameplay I'm of course willing to address them. So, that's pretty much it, I don't really have anything more specific in mind at this point. With a such small map, start with a bonus makes a big difference. what about 3 starting positions with 4 components? Sure, those can be coded in. I'll add them to the first post. I am in favor of this map still. Graphically speaking, I rather preferred version 1: http://img6.imageshack.us/img6/4523/eurasiamini.png I wonder if some middle ground could be made by blending the thick inner outlines into the main land color gradient-style. Hopefully I am making sense here, ha. I'm pressing the like button on this one. Gameplay looks good, well done. So, any graphical issues I should address? I still think a little more blending could be done with those thick color borders. I just think it doesn't quite look right. I feel like it cheapens the look just a tad. The mini is so---mini! It's cute like Mongol Empire small. The word "Mini" in the title is kinda pixely, could it be the font or just the anti-aliasing? It's worse on the small map. Different font or color should fix that up. but that gets completely lost of the small to the point of bluriness. AndyDufresne wrote: The mini is so---mini! It's cute like Mongol Empire small. That's kind of the point of this map. RedBaron0 wrote: The word "Mini" in the title is kinda pixely, could it be the font or just the anti-aliasing? It's worse on the small map. Different font or color should fix that up. Nope, that's just the font, or maybe an optical illusion. The text is set to follow a bezier path so the slant is consistent there. I could try making the lines thicker on the small. Can i ask what font the Eurasia title is? Probably wanna alter the path of your borders on the small map for Central Europe and East India, so the whole name fits within the bounds of the territory, or have it so the words aren't overlapping the border.